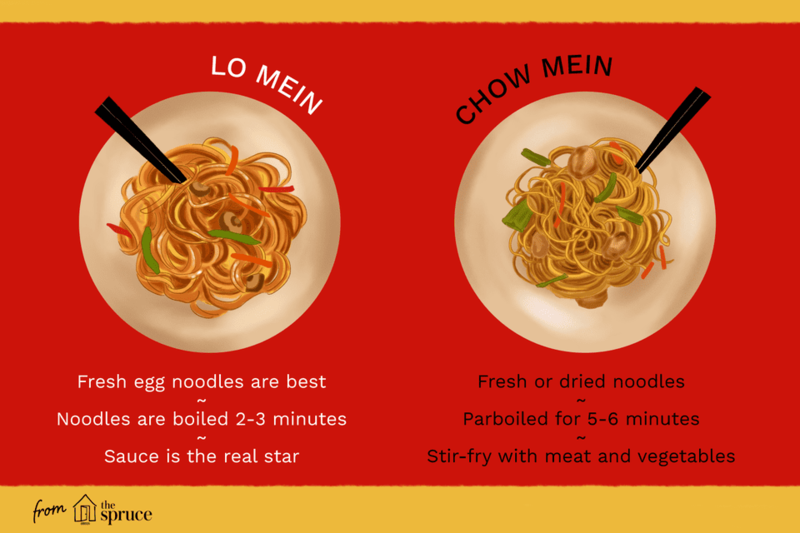 What's the Difference Between Lo Mein and Chow Mein? People frequently assume that the main difference between lo mein and chow mein is the type of noodles that are used. It makes sense—after all, chow mein noodles are crisp while lo mein noodles are soft, right? Actually, the main distinction between these two popular dishes lies in how the noodles are prepared. Mein or mian is simply the Chinese word for noodles. Lo Mein means "tossed noodles," while chow mein or chao mian means "fried noodles." Both lo mein and chow mein are made with Chinese egg noodles—wheat flour noodles with egg added. Fresh egg noodles (preferably about 1/4-inch thick) are best for lo mein, while either fresh or dried can be used to make chow mein. Either way, the noodles need to be softened in boiling water before cooking. Dried noodles are parboiled in boiling water for 5 to 6 minutes before using, while fresh egg noodles only need to be boiled for 2 to 3 minutes. The exact amount of cooking time will depend on the thickness of the noodles, so be sure to follow the package instructions if available. But whether you're working with fresh or dried noodles, the goal is to boil them until they are just cooked but not too soft (what the Italian's call "al dente," or "cooked to the tooth"). If Chinese egg noodles aren't available, Italian pasta such as fettucini or linguini make a handy substitute. A "quick and dirty" lo mein can be made by using Ramen noodles with a flavor packet. Watch Now: What's the Difference Between Chow Mein, Chow Fun, Lo Mein, and Mei Fun? One method of preparing chow mein noodles is to fry them separately into a “noodle pancake” and then pour the stir-fried meat and vegetables over the fried noodles. The chow mein noodles can also be stir-fried with the meat/poultry and vegetables. With lo mein, the parboiled noodles are frequently added near the end of cooking to heat through and toss with the other ingredients and sauce. Alternately, the parboiled noodles may be tossed with a sauce and the stir-fried ingredients poured over. Since the real star of any lo mein dish is the sauce, it's not surprising that Lo Mein recipes often use more sauce than chow mein recipes. It all comes down to your personal taste. Soft lo mein noodles soak up more of the sauce. On the other hand, you can get a greater variety of texture in a chow mein dish. For example, crunchy noodles and celery could be combined with soft mushrooms, bean sprouts, and juicy tomatoes. While chow mein with thin crisp noodles is a staple of many Chinese take-out restaurants, more authentic versions of chao mian have soft noodles. The main difference between the two comes down to frying time: for dryer, crisper noodles, add more oil and increase the frying time. Chicken chow mein: The classic Chinese dish. Baked chicken chow mein: This is made with broiled noodles to cut down on the fat. Tofu and cashew chow mein: This one is for the vegetarian. Turkey chow mein: This is a great way to use up leftover cooked turkey, or you can use canned turkey as well. Beef and broccoli lo mein with ramen: The flavor packet from the Ramen noodles is combined with oyster sauce to lend flavor to marinated beef and broccoli. Shrimp lo mein with three vegetables: Bamboo shoots, mushrooms, and red pepper lend flavor to this seafood noodle dish.